Do you want to take your living outdoors? Do you envision sipping your morning coffee while you overlook the neighborhood and listen to the birds chirp? If so, both you and your home deserve a custom porch addition by the home improvement experts at Eby Exteriors! Whether you opt for a front porch addition, a screened in back porch, or both, porch additions will create extra living space and bring the outdoors in. That being said, porches are much more than comfortable spots to enjoy the great outdoors. In fact, a well-planned and well-built porch will boost your curb appeal, let you showcase your style, and create an inviting and relaxed space to entertain guests as well. The spring and summer months are beautiful here in Central PA, so that means more time spent outside on the front porch enjoying the greenery and fresh air. With summer in full bloom, there’s no time like the present to spruce up the front of your home with a beautiful and inviting front porch addition. A front porch sets the tone for your home and provides guests with an impressive preview of what’s on the other side of the door. Most people make their minds up about a home before they even step foot in the front door. With a well-designed enclosed porch, you can make the best first impression possible and enjoy a charming space for relaxing and entertaining as well. A front porch is a must for every Wyomissing, York, Harrisburg, and Lancaster-area home, but a well-made backyard porch provides even more opportunities to entertain, relax, and enjoy the outdoors. Whether you opt for a screened in back porch addition with ceiling fans, decorative lighting, and perhaps a fireplace, or prefer the laid back simplicity of an open porch that spills seamlessly into the rest of your backyard, your wants and needs can be achieved with a custom crafted back porch addition. Extend the Seasons with an Enclosed Porch – A covered porch can offer protection from sunlight, rainfall, and snow, but open walls do little to keep cold weather and bugs at bay. Screened in porches are the perfect solution. They can be an extension of your home leading to a beautiful deck or patio. In addition to keeping your porch drier, warmer, and bug-free, an enclosed porch can become a bright and beautiful extension of the inside of your home and be enjoyed year-round. From radiant heat floors and insulation to crown molding and fireplaces, there’s no limit when designing the perfect screened in porches for your home. The Details Make the Difference – Well-done front or back porch additions are built to perfectly complement a home’s architecture. Most covered porches simply extend along the front or the back of the home. However, wraparound porches work beautifully with many Pennsylvania homes and provide added outdoor living space for rocking, relaxing, dining, entertaining, and more. When planning your own custom covered front porch or back porch, make sure to include details like moldings, trim, and flooring that can be integrated both outdoors and in. Lights and ceiling fans can also be added to serve as focal points and provide air circulation and illumination for around the clock enjoyment. The key to getting the most out of your porch is including the accents and amenities that match your lifestyle. Some may only want a table and chairs for al fresco dining, while others may want to go all out with a fireplace for cozying up on cool Pennsylvania nights. Whatever your wants and needs, Eby Exteriors has the experience and expertise to build the perfect front or back porch for your home. Our first-class installers and craftsmen set us apart from the competition. They’re friendly people you can trust and believe in providing each and every client with nothing but the very best service. We pride ourselves on building beautiful and durable porches that will last for several generations. That’s why our customers consistently rank us the #1 installer of home additions in the greater Lancaster, York, Harrisburg & Wyomissing, PA areas. 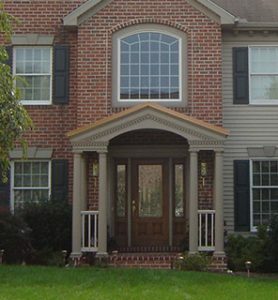 With outstanding warranties and craftsmanship that is second to none, we’re the pros to call for your porch addition. Call us to discuss your project and receive a free estimate today!